Online Store is an easy-to-use website builder for creating your business's virtual storefront and getting it online. No technical skills are required, which means you can sell your products and services to customers all around the world. Use the Get Started window to enter your business name. Select a domain from your account, or create a sub-domain using a domain in your account for your website. 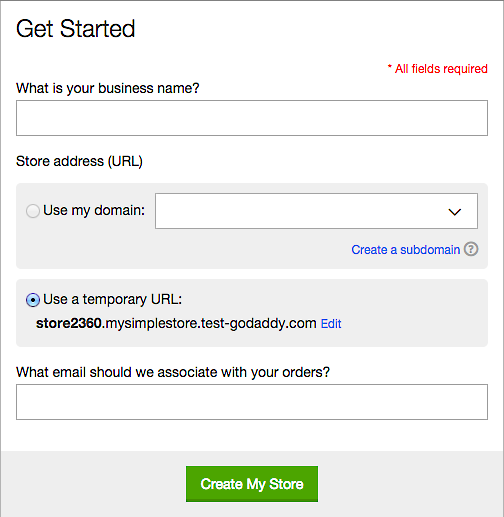 Note: If you don't have an available domain, you can also choose to set up your Online Store with a temporary domain. Your store will be accessible through yourtemporaryname.mysimplestore.com, until you've assigned it to your own Web address. Enter your contact email address and then click Create My Store. If this is your first time in your Online Store account, a Getting Started Guide will walk you through the process of setting up your store. If the guide does not display, click on the Settings or Store Design tabs, to customize your store.